Usually when using a hard brush, the circle which represents the bush side, and where it will paint, is the same size as the painting area. 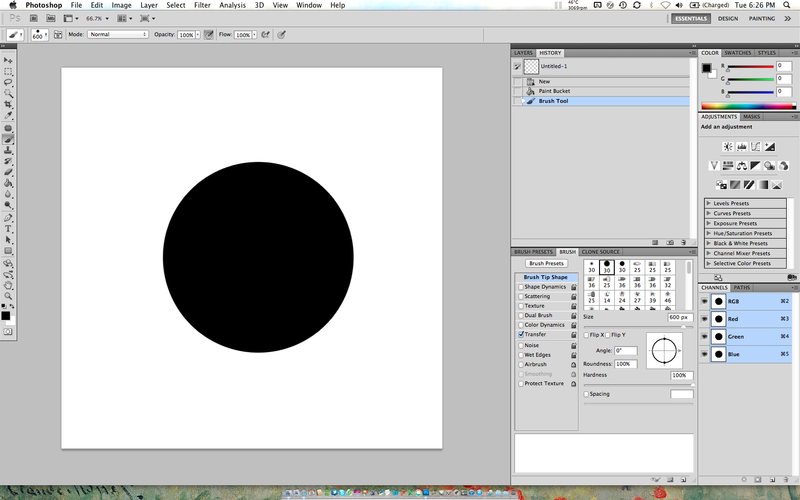 But at some point in the past (i have no idea when), my photoshop brushes have become larger than the painging area. I have tried every brush setting, precise, normal, and full size. 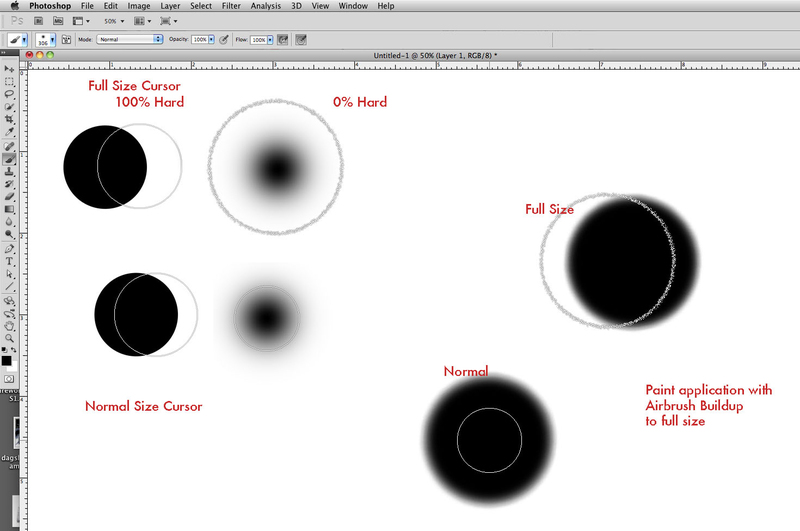 Full size is just larger than normal, but normal is still larger than the area painted by a 100% opacity 100% hard brush. Im using CS5 on my mac. Tried painting with a 1px brush, the opposite happens. When painting on white, at 1px photoshop paints 3 or 4 px a grey colour, it takes a few clicks to get a white pixel (surrounded by a couple of grey ones), though this isn't an issue, and i think its something to do with smoothing. If I set the brush to 0% hardness, the brush circle size decreases, and if i then click repeatedly, the maximum area the brush covers (at the 50% point) is where the circle shows (how it should work, i think). This happens on every brush, both the default ones and any custom brushes you have. It happens at any dimension or angle. Also reset brushes back to default. OK, if you're using Full Size Brush Tip cursors - then it should match. But it sounds like you set it to "Normal Brush Tip" which shows the outline at 50%. What OS version are you using? 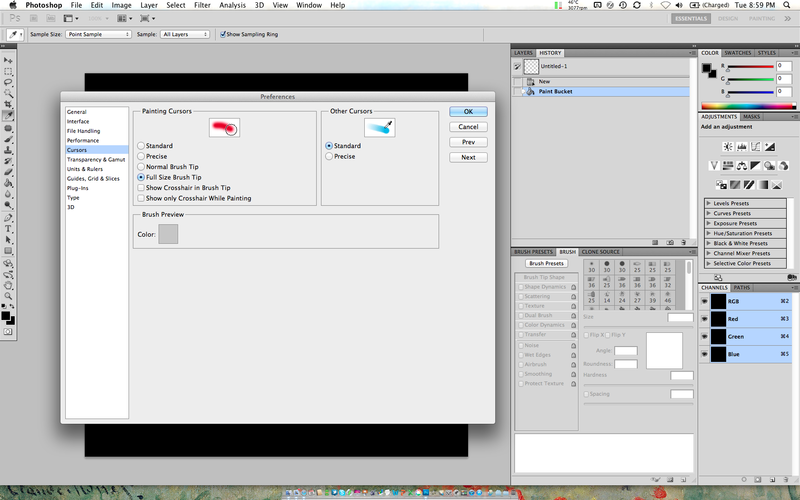 10.7.x does have several video card driver bugs that mess up brush cursors. Hopefully Apple will fix the remaining video driver bugs soon. Can you post something similar to show what you're seeing in terms of the relative size of the cursor to the paint that's being laid down? Jeffrey, thanks a lot for any help !!! I am looking forward for your answering !!! In your screen shot, the brush preview in the upper left (600), it looks like the brush hardness is less than 100% which would account for the area where the edge would be blurry if you click the mouse. Could someone help me please!! Is it the case also when transfer or pen pressure controls opacity is off? I solved it, the issues was related to Universal Access, the cursor size was a little increased... Finally I got it fixed !!! I have the same problem, and i can't fix through the cursor preferences (cmd+k). What do you mean by Universal Access, please help!! dont just say got it how did you fix it!!?? im having the same problem i have no idea how it happened or how to fix it im freaking crying this is the worst! If you have a mac, I think its under "accessibility". Then set your cursor options on the standard default settings. Thats how i fixed mine. I had played with the settings and made things too fancy for photoshop! OK! changing the cursor size and display contrast fixed the problem. Does that mean that if I'm disabled and need to adjust those settings that I'll have the same problem again? Not sure the trade-off is worth it. I guess the only way is to switch back and forth when you use Photoshop. I have upgraded to El Capitan OS since it happened, so I don't know if it still does it - My Mac was running Yosemite OS at the time. I really liked the cursor adjustment until it messed with Photoshop. I'd like to use Universal Access to enlarge my cursor for general use but not affect CS5. I've just recently caught up with the rest of the world upgrading from CS3 and a Power Mac G5 to an '08 Mac Pro running 10.6.8 with CS5 and this wasn't an issue on the G5 running 10.5.8. Specifically, to fix this issue (Mac only), go to "System Preferences", find the "Accessibility" pane, and choose "Display" from the left column. Move the "Cursor Size" slider all the way to the left. Note that this IS a Photoshop a bug because Photoshop cursors should not be effected by the system setting for mouse point cursor. For those of us with high resolution monitors, it's advantageous to have a larger mouse pointer for web browsing, etc., and we shouldn't need to turn that setting off whenever we use Creative Cloud. This bug also applies to the eraser since it's a brush. Photoshop cursors have to be affected by the OS scaling - because the OS is scaling them, not Photoshop. That's correct. However, even though Mac OS is doing the scaling, Adobe can and should still respond to this issue that effects their product's users. For example, it's possible for Photoshop software to read the system preference and compensate a 25% increase by scaling its cursor 25% smaller. At the very least, there could be a note in the Photoshop cursors preferences pane or in official documentation that this could happen. Thank you so much for the fix, my Photoshop eraser cursor has been offset for a month just because I changed that cursor setting on a new laptop, I had spent hours trying to re-normalize it! I would have never thought of the 'Accessibility' factor. Worked for us! Thank you so much! Thanks so much Matthew. You're the only person who gave a succinct and effective means of correcting this problem. ZERO thanks to drcarvalho for not sharing the way he fixed his problem. Any fix for Windows? Not finding any so far. See the previous posts for settings you may have changed to cause this. This worked for me: I right clicked the Photoshop shortcut in C:\ProgramData\Microsoft\Windows\Start Menu\Programs, clicked Properties, clicked Compatibility, and then ticked Override high DPI scaling behavior. Then for 'Scaling performed by', I chose 'Application'. Click 'OK' and then reopen Photoshop. Try on windows CTRL + Right mouse button. You will get a red preview and moving the mouse to the left makes it smaller, to the right bigger. Up and down is opacity. BTW: It would be better if up & down would be hardness, because opacity can you change with the number key pad much more precisely and for hardness it helps to have the red preview. Thanks but this didn't work for me. When you adjust the DPI scaling behavior it reverts the menus down to ridiculously tiny size on my laptop. My desktop does not have this problem. No idea what Control plus right click on mouse is supposed to do. Nothing but menu which doesn't help at all. Nothing in photoshop. Tried preferences in photoshop; tried cursor thickness in system. I tried upgrading with the update to my CS6 version, then there is a problem right at the end. Supposed to download "Adobe support assist" to help, but guess what? That doesn't exist now. I understand the no support rule for CS6, but this is unacceptable. I have to be able to use the program within reason. This is not a little bug. It makes photoshop close to useless. Are you on Mac or Windows? It sounds like Windows - and this topic is primarily about an issue with the macOS Accessibility setting for cursor scaling. It turns out it's in the System Prefs! The cursor size is not set to Normal or 100%. I'm having a similar issue where my brush is drawing wider than what the cursor is displaying on the screen in photoshop. I'm using windows. Any help? go to SYSTEM PREFERENCES / Accessibility / Display....set your Cursor Size to normal. IDK why the OS update screwed up a bunch of stuff in CC programs but it seems to for some reason.